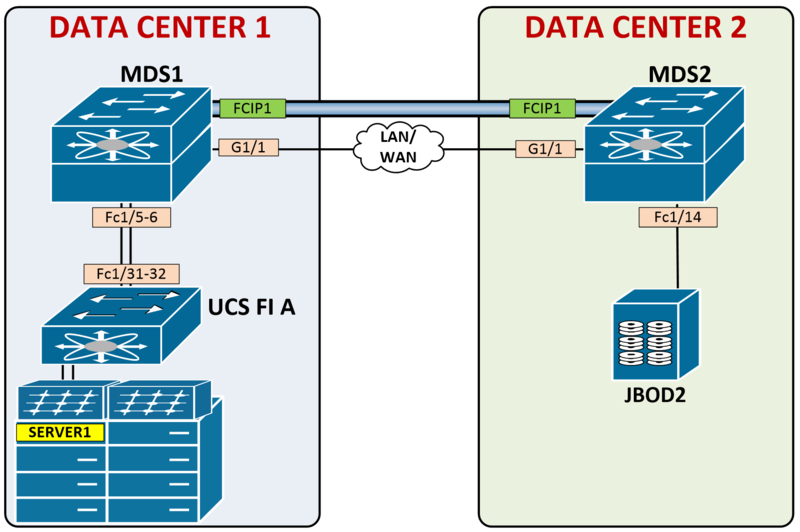 Fibre Channel over IP (FCIP) is a tunneling protocol used to connect FC networks across IP networks, such as a WAN. It uses TCP with the DF bit set. 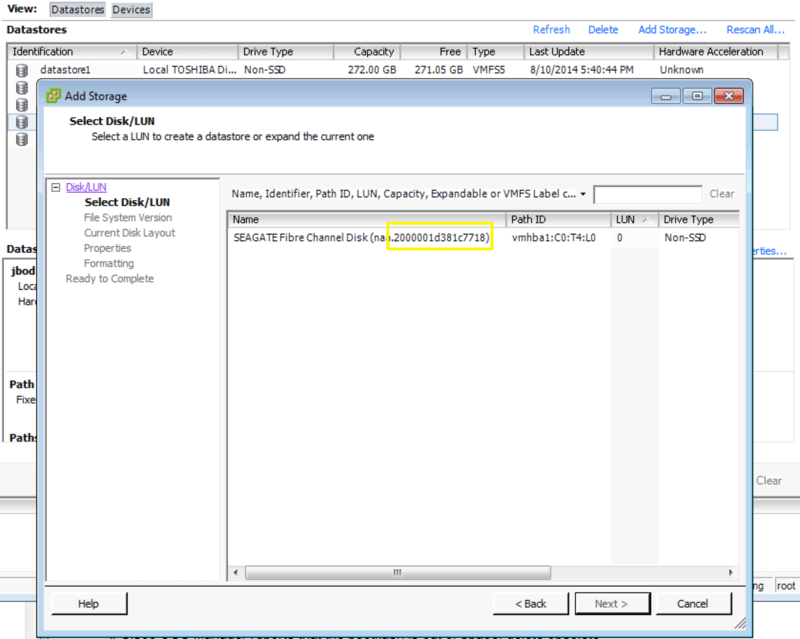 Being that this is IP storage, it is only supported on the MDS platform. The basic configuration is straight forward, but be aware that there are lots of configurable tweaks. In this blog post I’ll be going through the configuration of several FCIP topologies, feel free to follow along. At the end I’ll post a quick template. Below is the topology we’re looking at. 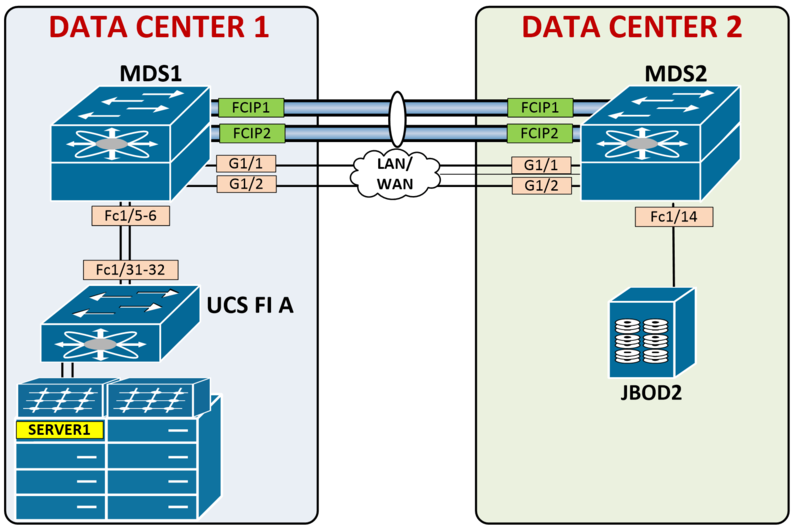 We have a server in Data Center 1 that needs to attach to JBOD storage in Data Center 2 over the IP network. To accomplish this, we’ll create an FCIP tunnel between MDS1 in Data Center 1 and MDS2 in Data Center 2. Let’s check out our current FCNS database, notice we only see pWWNs from our own Domain ID 0x01. There are few options here, you can configure a standard IP interfaces, VLAN sub-interface or a Port-channel. First, let’s configure a standard, single interface and run through a basic FCIP setup. PING 10.130.100.1 (10.130.100.1) 56(84) bytes of data. To display the routing table, you must envoke the ips (IP Storage) command. Notice the route does not show in the normal “show ip route”. This is the profile that will be referenced by the fcip interface. Tons of customization you can do here, which we’ll take a look at later on, but for now let’s configure the bare minimum – our source IP address. This is a virtual tunnel interface, similar to GRE. You need to reference your fcip profile and the IP address of your peer. Verify the fcip tunnel status. You can see quite a bit of information here, especially for a summary command. Notice physical interface, peer ip address, trunking status, TE port type, bandwidth and calculated round trip time. Another helpful tweak if you’re running NAT is to configure the number of TCP connections used for the FCIP link from 2 connections (which is the default – 1 for data, 1 for control) to 1 connection. The default MTU on these interfaces is 1500 bytes. In order to eliminate fragmentation, recommended to set the MTU to 2300 bytes. (2112 bytes for FC frame + 98 byte FCIP header, + some extra for good measure). I just cleared the counters and am going to transfer another file. If the MTU is set properly we should see zero reassembly frames. When link failures should go uninterrupted, configure port-channels. To configure this, you actually place the virtual fcip interfaces in the port-channel, NOT the physical gig interfaces. Using our same configuration, simply add the fcip interfaces to a port-channel and “no shut” them to bring them back up. You may configure VLAN sub-interfaces in a scenario where the FCIP peers must be layer 2 adjacent and you need to trunk, or dare I say, OTV the VLAN between end-points. 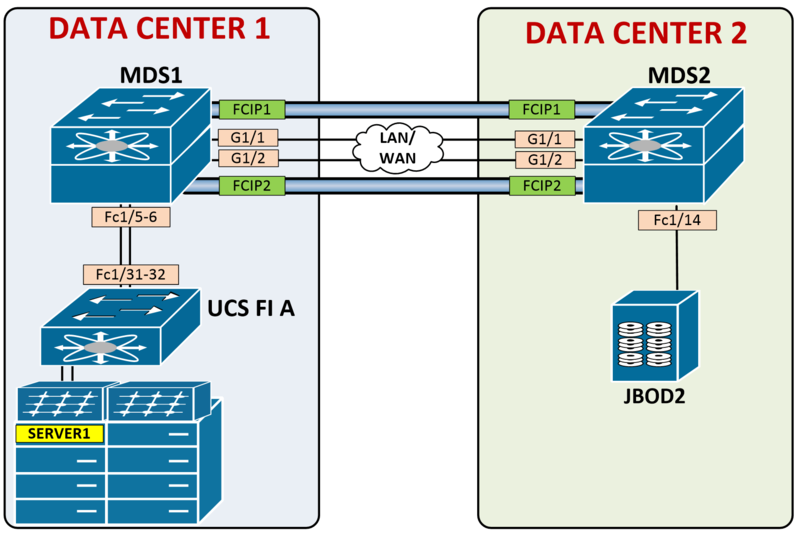 Or maybe you have segregated FCIP peers and need to use VLANs for the isolation. Whatever it may be, FCIP supports this functionality. I’m blowing away the old interface config and going to configure this as sub-interfaces instead, each with it’s own FCIP profile and FCIP interface. As I mentioned earlier, there are tons of customizations you can configure. All of these below can be configured under the fcip profile. TCP performance tuning over a WAN can turn into quite a lengthy conversation. 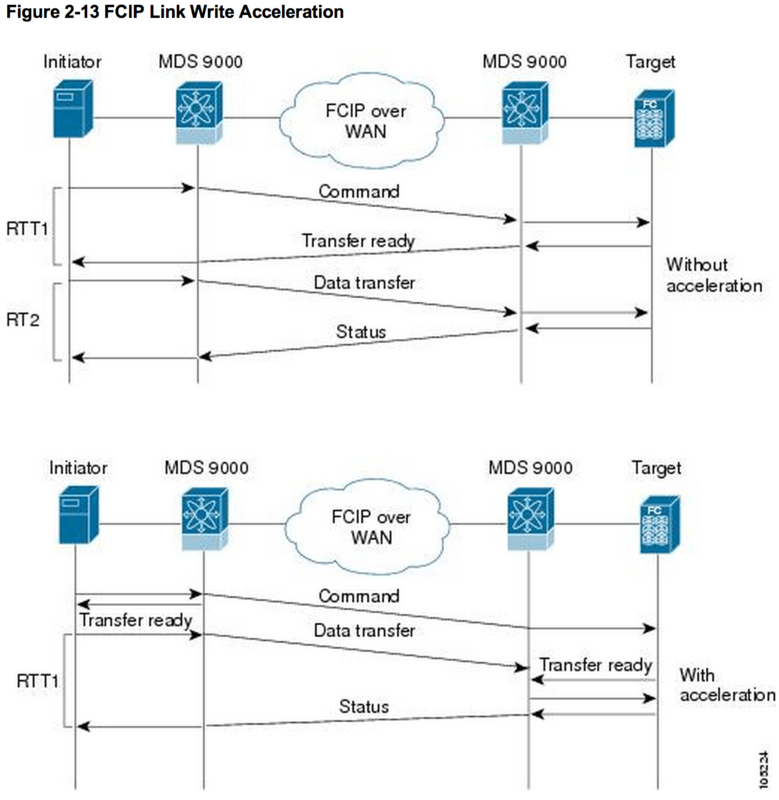 From an FCIP configuration perspective, optimal TCP windows size is derived from 3 values: Maximum bandwidth allowed, minimum available bandwidth, and round trip time (RTT). Note: write acceleration cannot be used with FSPF ECMP. You can, however, use port-channels. Keep this in mind if asked to configure FCIP optimally for a WAN connection. Let’s copy a file to the datastore again and verify we see exchanges processed by write acceleration. Quick Template with 2 interfaces, preferring the path over G1/1 as the primary, using G1/2 as a backup. great info. Thanks for sharing this. Since there are two ways to change the FCIP port (first under FCIP profile and second under FCIP interface with peer- ip address command), are they to achieve the same purpose? Thank you for the comments. What I would do in a situation where the port needed to be changed is configure it under the FCIP profile. Then, under the FCIP interface on the peer device, configure the destination port to match. If two-way communication initiated from either side needs to occur over the non-standard port, you would need to do the same on the other MDS. What is the default cost of fcip link, any document to refer for default cost of fcip link? Excellent Article! Well deserved CCIE DC!! Congrats. Overlaid, I am finding all the information you post i.e..iscsi and now fcip to be great review, gap resolution and insures I understand the technology before moving on to other topics. I have my 5 day ipexpert boot-camp Aug 3rd to the 7th and then my first attempt at the lab on the 10th. Thanks for all your write-ups as I plan to review more. Thanks for the kind words, Zachary! Sounds like you have a solid plan, best of luck to you on your journey to mastery!